The Budget was announced by Ministers Brendan Howlin and Michael Noonan on 05th December. Below is a summary of changes which affect employers. The Income Tax rates remain at 20% and 41% for 2013. There are no changes to Personal Tax Credits or Standard Rate Cut Off Points. There are no operational changes to the treatment of USC for employers. 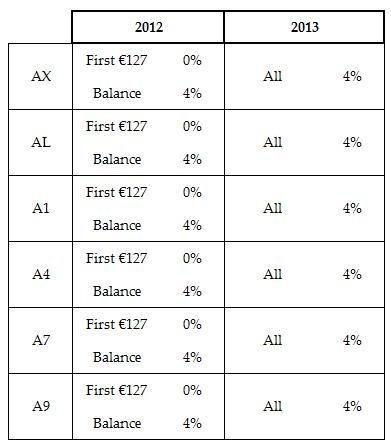 From an employee prospective there are no changes to the Standard rates or Cut Off Points in relation to USC, they are the same as last year. The annual income exemption threshold of €10,036 continues to apply for 2013, the process of employee self election to Revenue still applies. The P2C (Tax Credit File) issued by Revenue will allocate the correct USC rates and Cut Off Points per employee. As was the case in 2012, no action is to be taken by the employer other than to apply the details of the latest tax credit file. It is important that you apply the latest detail as per the 2013 P2C/tax credit file as soon as it is received and if possible before completing the first pay period in order to avoid a claw back of USC for any individuals who qualified for the reduced higher rate of USC in 2012 but no longer qualify in 2013. 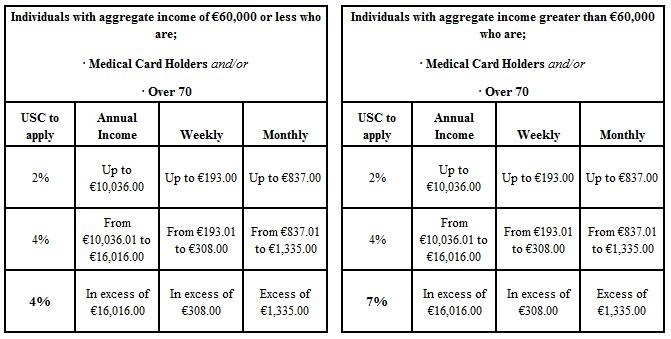 The Employee's PRSI-Free Allowance of €127 per week (for those paying PRSI Class A, E and H) and €26 per week (for those paying PRSI Class B, C and D) will be abolished from 01st January 2013. Employees who earn €352 or less per week continue to have no liability to make a PRSI contribution and are not affected by the abolition of the weekly PRSI-Free Allowance. From 01st January 2014, the exemption from PRSI applying to all employees with unearned income only, i.e. income generated from wealth such as investment income, deposit interest and rental income, will be abolished. The minimum annual PRSI contribution for people with annual self-employed income over €5,000 increases from €253 per annum to €500 per annum. Maternity and Adoptive Benefit will be taxable for all claimants with effect from 1 July 2013. As with all Department of Social Protection benefits it is not subject to USC. Health and Safety Benefit, payable to pregnant or breastfeeding mothers, is a form of Maternity Benefit and will also be subject to the same tax rules as Maternity Benefit. Once Revenue issue guidelines relating to the procedures to be adopted by employers to operate the taxation of Maternity Benefit we will issue a payroll upgrade, this will be prior to effective date of 01st July 2013. Top Slicing Relief will no longer be available for persons who receive an ex-gratia payment, excluding statutory redundancy, where the amount is €200,000 or more. This provision has effect for payments made on or after 1 January 2013. A scheme called the ‘Plus One Initiative’ will replace both the Revenue Job Assist and Employer Job (PRSI) Incentive Scheme. Full details of this change have yet to be will be announced. From 1 July 2013, residential property owners will be liable for an LPT based on the self-assessed market value of their property on 1 May 2013. Once Revenue issue guidelines relating to the procedures to be adopted by employers to deduct and remit this tax to Revenue we will issue a payroll upgrade, this will be prior to effective date of 01st July 2013. See our article “Local Property Tax (LPT) effective from 01st July 2013” for further information. Despite speculation throughout the latter half of 2012 a Statutory Sick Paye scheme was not announced in the 2013 Budget.